Leg ulcers: does it stay open or can we keep hoping? 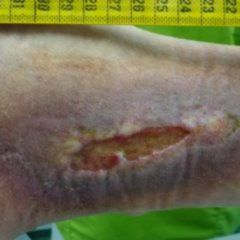 Not infrequently a chronic wound becomes an amputation. Research devotes considerable resources in order to develop new dressings. The course of the disease is not only affected by what is used against it, but also where specialist care is given to its patients. Spray over it once and the wound shuts off. Even with chronic ulcers. At least that’s what a recent study with 180 participants, sponsored by the manufacturer of a new type of “wound spray”, says. The mixture of fibrinogen and keratinocytes has already helped, according to the report in the Lancet, 40 percent of users just with a single application. In seven out of ten subjects the wound healed within three months. The crux of the matter: the cells are obtained by the American company from the foreskins of circumcised infants. In doing so the skin cells do not create the basis for a new layer over the wound, but only provide growth factors that promote its closure. Fibrinogen alone as it is now has already taken about half of those involved in the studies right to the end of a successful three-month therapy. If the new spray dressing makes it onto the market, it should be even more convenient than the expensive high-tech wound dressings, which demand labour and time for intensive cultivation of autologous hair root cells and which have now been approved. The demand for good prescriptions for use against poorly healing wounds is rising: experience of “an open leg” is something had on average by one in sixty of those over the age of 65 years. Standardised wound care heals only 30-75 percent of ulceration cases. The rest become chronic wounds. Experts estimate the number of these patients in Germany to be around four million. The rate of new cases is around 650,000. Approximately every 15th diabetic can be counted as being, if they go without getting appropriate care, threatened with amputation. The fact that dry wounds heal more poorly than moist ones has been known since studies done by George Winter 50 years ago. Nevertheless data from Germany says that only one in five chronic wounds receives a covering that provides enough moisture. Tap water serves still too often as a cleaning agent, despite the risk of infection – in the worst case with multi-resistant strains of bacteria. Equally problematic are disinfectants. They can sensitively disturb the regeneration of the skin, especially in the early stages. How is it done right then? 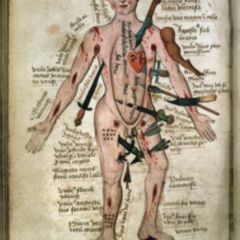 Recommendations for the treatment of chronic wounds in patients with peripheral arterial occlusive disease, diabetes and venous insufficiency has for several months been offered by a whole new S3 guideline, published by the German Society for Wound Healing and Wound Treatment in collaboration with a dozen other professional societies. Nevertheless, just by looking at the numbers alone those unaffected note that something is still wrong with the treatment of chronic wounds. Approximately 280,000 physicians are supposed to accomplish daily the time-consuming task of about one million debridements. Wound care is not in the syllabus of medical studies, and added to the often inadequate qualification is the unattractive remuneration. Many nursing professionals find the treatment at the hands of doctors to be inadequate. In the UK already in the ’90s “Leg Ulcer Clinics” were born, in which qualified nursing personnel attended to wound care. A few years ago in Germany also the duty of provision of specialised outpatient care was shifted. The Society for Health Care Concepts in Wound Management (GVW), a subsidiary of the pharmaceutical wholesaler Gehe, operates more than half a dozen wound centres. Under the supervision of a resident specialist physician, specialised “wound managers” care for their patients. The GVW touts itself using ISO-9001 certification and integrated treatment approaches that have been developed in Austria and according to its own statements high quality requirements are met. “Our approach is fully in line with a directive on the delegation of medical services involving specialised employees within the framework of pilot projects”, CEO André Lantin says in outlining the strategy of wound centres. 45 minutes per treatment unit are taken up by wound managers on their patients. Aside from changing dressing and wound treatment, it’s also about social issues, which in the case of short doctor-consultations or complicated bureaucracy creates an additional barrier to fast healing. The wound centres organise the cooperation of health funds, the physician, nursing and numerous specialists. These also include orthopaedic shoemakers or nutritionists who provide services to the patient. By 2015, a nationwide network of utilities should have emerged. Scientific studies on the success of this model, however, do not yet exist. A study by the Institute for Health and Nursing Care Economy at the University of Bremen shows however that case oriented treatment of problem wounds has considerable advantages: the treatment is completed on average after nine weeks, conventional wound therapy would last an average of 40 weeks. This is also reflected in the cost: modern wound dressings, highly skilled professionals and modern technology used in case management are expensive, but expenses are offset by rapid healing. Dressing materials which come from development labs at large research institutions are in themselves no guarantee for solving the problem of “chronic wounds”. “The inflationary flood onto the German market during the last 20 years of medical devices for the treatment of chronic wounds sits in sharp contrast to a lack of region-wide positive quality outcomes”, writes Gernold Wozniak of the Miners’ Association Hospital Bottrop (Knappschaftskrankenhaus Bottrop) in a review article in the journal Surgery from last year. “The use of these sometimes very expensive wound care products is purposeful only when it is embedded in a consistent, reproducible and well-documented qualification process relating to the removal of the cause and to wound preparation and possibly plastic reconstruction”. Probably only then, when the consistent utilisation of new but expensive products, such as the use of stem cells, occurs where necessary, and new avenues for patient care are just as willingly explored, can some patients who have often been grappling for years with open leg wounds hold hope. The prospects that the number of people affected will diminish are relatively poor. Nobody has mentioned Medical Infrared Lasers. I have seen these give dramatic results in healing leg ulcers. These are used in a number of UK Hospitals.